Could this be the most famous car park in the UK at the moment? 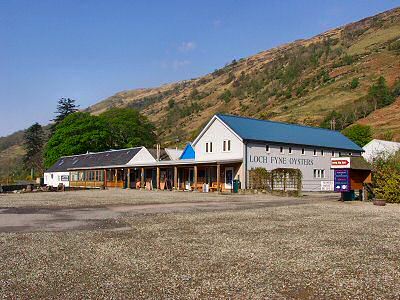 The car park of the Loch Fyne Oyster Bar? Allegedly this is where John Prescott and Gordon Brown agreed the successor for Tony Blair (also at the BBC). If they really stayed in the car for ninety minutes as reported they missed a very nice lunch. I've had lunch or dinner at the restaurant several times and stocked up on smoked salmon from the shop as well. Very nice. And too good to miss, even if you have to discuss the future of the Labour Party. Well, if they are invited to the wedding of Jane Smith and Malcolm Robertson on Islay in June they have another chance, after all it's on the way to Islay.